I didn’t mean to do it. 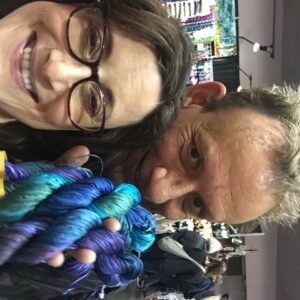 Honestly, I had the best intentions to follow direction when I asked StephenBe to help me pick yarns to knit his pattern, the Shawlvest, when we were both at StitchesWest. 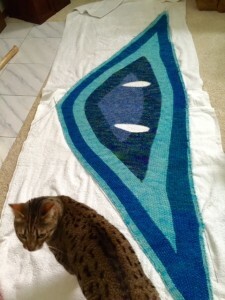 I carefully listened as he advised me how to place the colors and mix them, as 3 yarns are held together throughout the project. 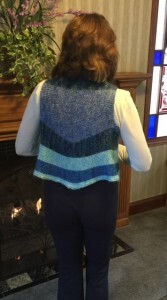 But no sooner had I bought the yarn, I started thinking about the shape of the garment and how much fun it would be to incorporate Annetarsia into the knitting. 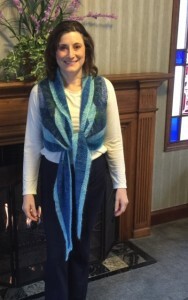 As soon as I wound up the yarn and started knitting, the urge to add different colors was irresistible. It was so easy! 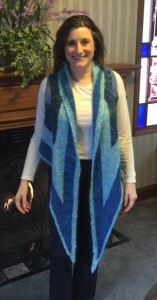 And…here is the finished Annetarsia Shawlvest! Worn with thin blue edge on the bottom and left loose. Hey, the private side looks great, too! It’s reversible. Ends are buried into the links between color sections. 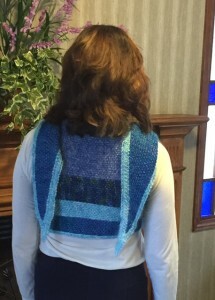 Worn with thin blue edge on top, and spread out so that you can see the striping. 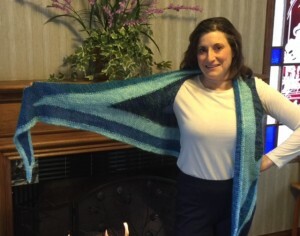 It was fun to knit, and was really easy to turn into Annetarsia. I just put a new color in the center of the row whenever I was getting a bit bored! I think Stephen will like it, as he appreciates the unexpected. (Although he probably expected me to do something like this, when I think about it!) I will be seeing him in a few weeks at Yarnover – Sat. April 23rd, and can’t wait to show it to him in person! 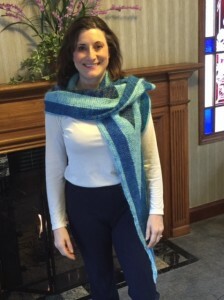 The Minnesota Knitter’s guild is celebrating the 30th anniversary of Yarnover, and I am so happy to be invited to join them and be one of the teachers at this outstanding event. If you love StephenBe, or haven’t had the opportunity to fall in love with his creativity and talent, check out the website. StephenBe.com. Also, if you haven’t experienced the heart and laughter that is stephenbe.tv, what are you waiting for? This reality TV show involves Stephen Be and Steven West, and all of the amazing, fun and adorable folks who inhabit the Yarn Garage and World of Stephen and Steven. It is an absolute hoot, and I dare you not to binge watch!!! Personal knitting is over, and now I will start knitting samples for my next Craftsy class, which I am very excited about. 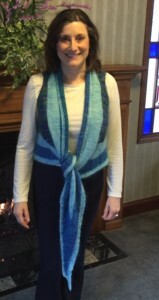 Also traveling to Stitches South and Yarnover, to teach. Hope to see you there!